You may purchase Karin Herzog products on my website. I have used these products 20 years and know this line so well. I want everyone to use Karin Herzog, so I want to give you excellent pricing. Then you can have No excuses not to purchase. Save on every purchase. I offer free Shipping in the US. If you need help choosing your products, please let me know. The correct products make all the difference. The Professional Cleansing Cream is my all time favorite product. It is deceiving. When you first look at it, it has the appearance of Vaseline. You only use the size of a pearl, emulsify it with water on your fingertips before even touching the skin. Then you massage the skin with the cleansing cream. If you feel you need a little more, just wet your fingertips with water and massage you face. You may go around the delicate eye area. This product is so great in removing your eye makeup. Use a wet cotton pad or wet cloth and remove the Professional Cleansing Cream. You may not rinse it off. Your face will be soft and dewy. Then finish with your favorite Vita A Kombi product. Even if you have oily skin, this product helps reduce clogged pores. It takes oil to remove oil. It is almost like a mini vacuum cleaner, cleaning out the skin. The woman behind the man. Dr. Herzog was the scientist that created the Karin Herzog line. He worked for 8 years studying oxygen and how it worked. It was his wife Karin Herzog a Beautician, that discovered how well the products worked on skin. She started using them in her Laboratory in Switzerland where she did skin care on her clients. 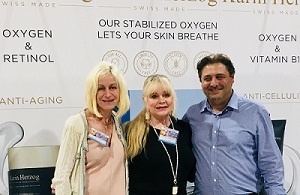 Now the Karin Herzog Oxygen Skin Care line is extensive and the only real oxygen skin care line on the market. Dr. Paul Herzog, the son of a Swiss diplomat and Austrian mother, studied firstly in Bucharest then in Vienna on the eve of World War II. In 1948, he worked to counter the poliomyelitis epidemic. The disease played havoc. The virus attacked the lungs and sufferers died of asphyxiation while helpless physicians could only stand by and watch. For Dr. Paul Herzog, this was the opportunity to show his inventive genius. Working with Professor Clarence Crafoord, he created an apparatus which compensates for any deficiency in the respiratory system. It was now possible to nurse those patients who were infected. Because in between time, Dr. Paul Herzog had developed an additional system to analyse the composition of the air inhaled and exhaled by people according to their age and constitution, in such a way as to reproduce this air during operations conducted under narcosis. All these many inventions earned him the title of Doctor Honoris Causa awarded by the Nobel Institute. Dr. Paul Herzog and others before him were aware of the fact that nascent oxygen is the best disinfectant. Unfortunately, this is a volatile element that cannot be preserved in a cream or any other equivalent substance. When Dr. Paul Herzog began to study the problem, physicians had already been trying to fix oxygen for more than half a century. His wife Karin helped him in his work. One day, while testing the effect of oxygen on skin, his wife Karin, who was a beautician, exclaimed: “But this is exactly what I need !”. It was in fact a dual discovery. Firstly, Dr. Paul Herzog succeeded in stabilizing oxygen, in fixing it inside a cream. Secondly, this oxygen, contained in the emulsion in liquid form, was released in gas form when coming into contact with skin and caused a form of pressure, i.e. a mechanical effect which literally injected oxygen beneath the skin. For its inventor, the advantage of this formula was obvious: the same emulsion is suitable for every type of skin inasmuch as the action of oxygen normalizes the functions of the epidermis. Once these functions are restored, it is simply a question of giving skin the vitamins and substances that are indispensable for its proper balance. Dr. Paul Herzog created his own range of products based on emulsion with oxygen. He tested it at length, firstly in a clinic in Stockholm. Encouraged by the results, Paul and Karin Herzog decided to open a Beauty Institute on the shores of Lake Geneva. The enthusiasm and loyalty of several thousands of treated customers prompted the couple to market their skincare line internationally. It carries the name of “Karin Herzog”. Mild Scrub. The best scrub on the market. Lightly exfolites the skin. For any skin type. Polishes and removes dead skin cells. Oxygen Face Cream Apply as a mask to the whole face. Apply 3 strips of plastic wrap across the forehead, nose, cheeks and from bottom lip down over chin. Do not apply over the nostril area. Leave on 10 minutes, then rinse. Vita A Kombi Facial Oil. Lightly massage the facial oil over the skin. Essential Mask Apply the Essential Mask over the Facial Oil as a mask. Re-apply the plastic strips of the same area. You may leave on from 10 to 20 minutes. Then rinse. Vita A Kombi. You may finish with a very light amount of Vita A Kombi to finish. Just the size of a pearl. You will be hydrated and beautiful. Cleanse the skin with whichever cleanser you have chosen. Lightly massage the skin and rinse. If you are using the Professional Cleansing Cream, emulsify the cleanser with water on your fingertips, until it turns into a clear gel. Then massage the face. You just need a small amount. remove with a wet cloth or cotton pads. Your skin will be soft and moist. Oxygen Face Cream. Apply The Oxygen Face Cream as a Mask to the entire face except the eyebrows and eye area. To really increase the results, apply 3 strips of plastic wrap on the skin. One over the forehead, one over the nose area. Leave the nostrils clear to breathe. One strip from the bottom lip to the neck. Lay down and leave on for 10 to 20 minutes. This will soften the sebum in the skin Then rinse. Vita A Kombi Facial Oil. Lightly massage the skin with your facial oil. Lightly blot. Vita A Kombi. Then apply a light amount of Vita A Kombi for your final moisturizer. Your skin will be hydrated, polished and healthy. For added results, apply the Karin Herzog Eye Cream. I have been online for 14 years with my skin care website. http://www.karinherzog-jmilan.com I have been with Karin Herzog for 15 years. I know this product line better than just about anyone. I love helping people learn how to care for their skin. Acne, anti-aging, pigmentation, melasma, cellulite and more. It is challenging and rewarding to find the answer to help you with your special needs. I try my best to make it affordable for you also. Visit my new beauty blog. http://www.joellasbeautyblog.com for informative information. Welcome to my site that is just for Karin Herzog information. I will bring you exciting facials and ideas for the products. Karin Herzog is the ” The World Leader in Oxygen Skin Care. I will discuss the different products so you know how to use them correctly and their benefits. The Karin Herzog line is so gentle on the skin, yet very effective. Madame Herzog treats the delicate skin as it should be. None abrasive and non irritating products. The proof is in using them. From Acne to Anti-aging, the Karin Herzog line is supurb. We have known each other over 20 years. The most lovely people you ever want to meet. Noel Herzog has the most beautiful skin. You want to just stand there and look at her. It is perfect and so luminous. She said her Mother Karin who is now 87 still has beautiful skin and no wrinkles. I got so many excellent ideas from Noel. It renewed my passion for Karin Herzog. There has been lots of changes the last few years. Now things are great. Noel and Danato are a great team and are surrounded some excellent people. Visit my website to purchase the Karin Herzog Products. We carry the full line and offer excellent prices in the shopping cart. They have White Morning which is for AM. It is a lightening cream, moisturizer that helps with pigmentation and to even the skin tone. Leaves the skin smooth and luminous. White Evening is a Mask. You use it PM several times per week. You may apply it as a mask or sleep in it all night. It is also made for pigmentation. Noel Herzog suggests using both products for better results. One in the AM and one in the PM. I am using them now. I am excited to see results. I met this women who is Armenian. She had bad pigmentation on her cheeks. After using these 2 products for a month, her pigmentation has really improved. See Discount in the shopping cart. We have sold Karin Herzog products over 20 years. Longer than anyone. I was a rep for them 15 years and trained many of the Estheticians that use these products. There are no other products like them, so let us help you pick the right products for you. Anti-aging, acne, hydration, and most skin concerns. Karin Herzog can help. The Oxygen kills the bacteria so if you have breakouts this will help. The oxygen also gives you incredible hydration, and will help even the skin tone. I have used and sold Karin Herzog more than 20 years. There is nothing like it. My video will give you a wonderful insight in how to use the products and understand how they work. I know these products better than anyone, so I am the best teacher for you. I have seen results for so many people. Anti-aging, healing, acne, rosacea, eczema, and more. Help for preventing scarring. I could go on and on. 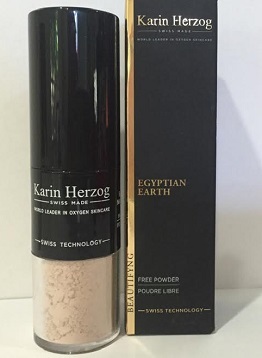 Finally Karin Herzog has come out with a new format for their Egyptian Earth Mineral Face Powder. It is in a tube with a brush enclosed. It is so much easier to use and the price sure is right. Before it was in a big pot and usages was messy. Now you can carry it in your purse of just use it quickly and off you go on your day. It comes in 4 beautiful colors. Magic Moonlight, the lightest. Magic Fair which is light but a little warmer. Isis which is perfect for medium/ darker skin or that sun kissed look. Hator is the darkest shade of all. You may find these on my website. http://www.karinherzog-jmilan.com You will see your discounted price in the shopping cart. Vita A Kombi 2 How to Use it.